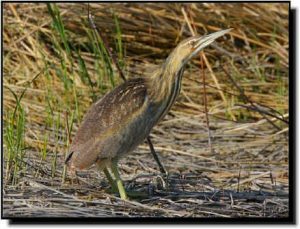 Comments: American Bitterns are short, stocky, solitary herons found in wetlands with tall, emergent vegetation. When startled they “freeze,” pointing their long necks and bills skyward, relying on their plumage to blend in with surrounding vegetation. Their pump-er-lunk call is unique and easy to recognize. American Bitterns are most active at dusk and dawn, but can be seen throughout the day along shorelines and edges of marshes. They eat amphibians, fish, crayfish, reptiles, small mammals and insects. American Bitterns are most likely confused with immature night-herons. They can be differentiated by the bold, distinctive stripes on the neck, lack of white spots on the wings and a longer, stretched-out appearance of the neck. They are found throughout most Great Plains wetlands, breeding across the continent from central Canada through Kansas. They winter from coastal U.S. through Central America.